What does the US want all these bases for? This map appeared in Smithsonian Magazine’s current issue, and represents a conservative estimate of the extent of U.S. military power. 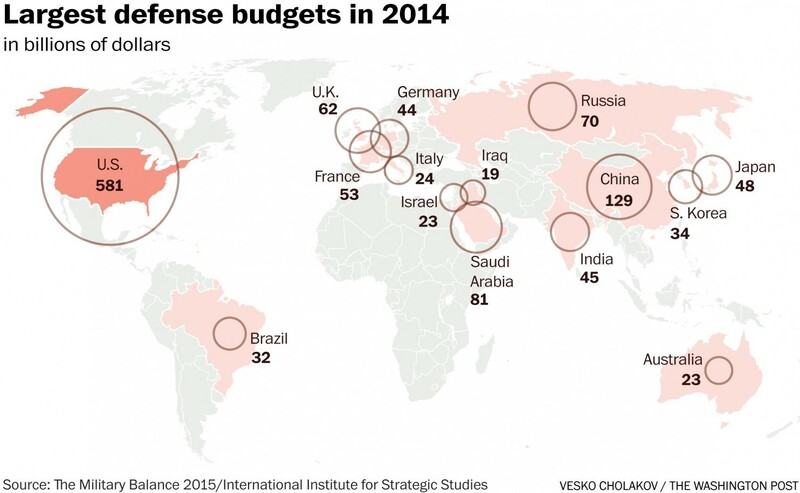 It shows the U.S. military has a presence in 80 countries. But Nick Turse, a reporter whose work is published in TomDispatch, was told that the total is really “more than 160” countries. He said it’s impossible to get an exact number of the bases, the names of the countries in which they are located or even the number of countries in which they’re located. It wouldn’t surprise me if there is no single individual in the Pentagon who actually has a complete list. The question is just what those goals are. Is the worldwide network of bases intended to wage war on terror, or is the war on terror a means to the goal of creating a worldwide network of bases? Do they make the U.S. more secure, or more likely to be drawn into foreign conflict? While the U.S. is building bases worldwide at the expense of the American taxpayer, China is building infrastructure throughout Africa and Asia by means of loans to be paid back by the host country. 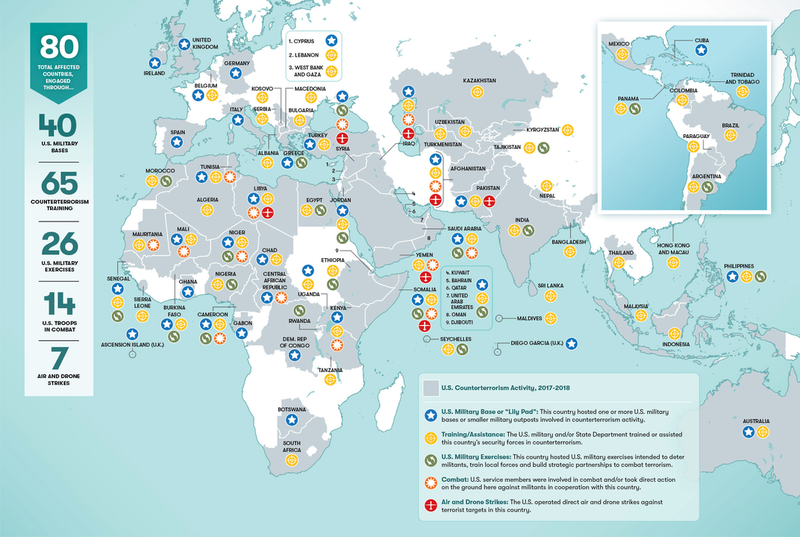 This Map Shows Where in the World the U.S. Military Is Combatting Terrorism by Stephanie Savell and SW Infographics for Smithsonian Magazine. Bases, Bases Everywhere….Except in the Pentagon’s Report by Nick Turse for TomDispatch. Has the Government Legalized Secret Defense Spending? by Matt Taibbi for Rolling Stone. Why the U.S. shouldn’t build any more foreign bases by Akhilesh Pillalamarri for Defense News. What’s behind Trump’s demands on NATO? 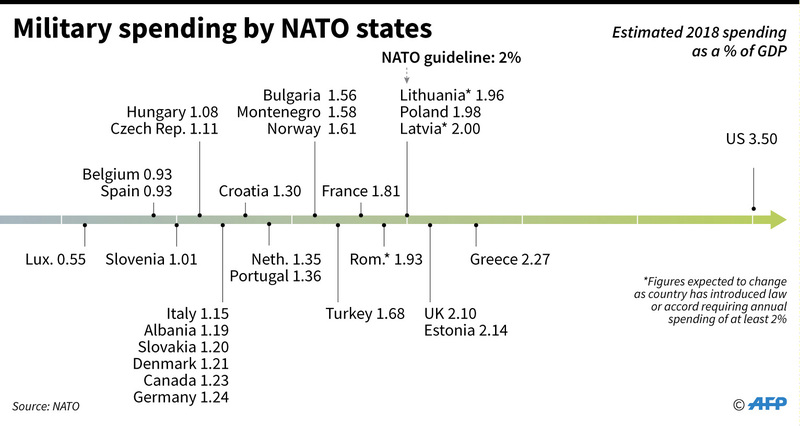 President Trump last week demanded that NATO allies, who have already pledged to increase their military spending to 2 percent of GDP by 2024, raise their spending to 4 percent. This is supposedly necessary to defend against Russia. Whether or not he really thinks Russia is that much of a threat, the fact is that the European members of NATO already outspend Russia by a considerable amount. According to the Stockholm International Peace Institute, Russia’s spending military spending last year was $66.3 billion, down from $69.2 billion in 2016. France spent $57.8 billion, the UK spent $47.2 billion and Germany spent $44.3 billion—a combined total of $149.3 billion, more than double what Russia spent. 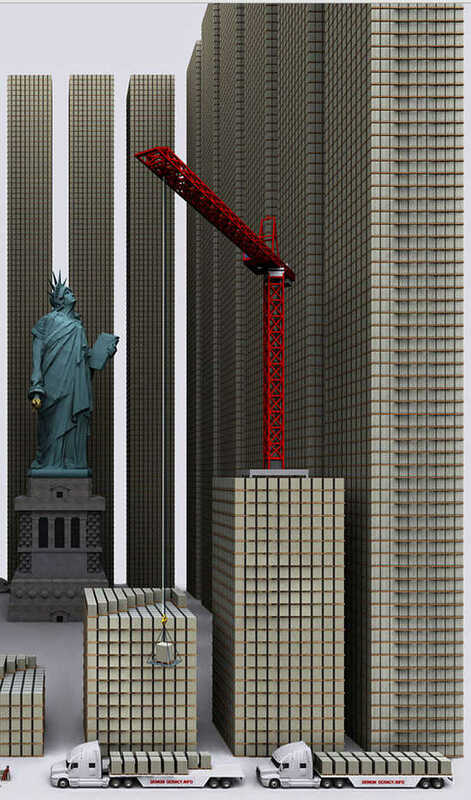 Estimated US spending was $610 billion. The International Institute for Strategic Studies made different but similar estimates. Its estimate was that Russia spent $61.2 billion last year, while the UK spent $50.7 billion, France spent $48.6 billion and Germany spent $41.7 billion—a combined total of $141 billion, also more than double Russia’s. The IISS estimated that US spent $602.8 billion. So what was the purpose of Trump’s demand? I think it was to increase sales by the U.S. armaments industry. I think his motivation was the same for his criticism Germany for importing 70 percent of its natural gas from Russia and planning a second natural gas pipeline across the Baltic. His goal is to have Germany import American liquefied natural gas (LNG), despite its higher cost and current lack of suitable infrastructure. Russia is just an excuse. He wants American companies to get Germany’s business.s. The European Union countries are competitors of the United States in world trade. Hence his hostility to the EU. Russia is not. Hence his lack of hostility to Russia. Donald Trump sees foreign affairs in terms of trade, and trade in terms of making deals. That is shortsighted. The way for the United States to regain our advantage in world trade is by building up our own industry, not by demanding other countries do things that are not in their own interest. Is Russia a worse threat than terrorism? The justification of the whole military buildup of the past 15 years has been the need to protect Americans against the threat of radical Islamic terrorism. Yet Secretary of Defense Ashton Carter, in recent testimony (actually several months ago, but I’m just catching up with it) ranks ranks terrorism as a lesser threat to the United States than Russia, China, Iran and North Korea. The governments of Russia, China and Iran are in fact enemies of the so-called Islamic State (ISIS) and the successors of Osama bin Laden’s Al Qaeda. Targeting them indirectly strengthens terrorism. What do Russia, China and Iran threaten? They do not threaten American citizens. They do not threaten the American homeland. What they threaten is U.S. military superiority in eastern Europe, eastern Asia and the Middle East. Protecting Americans from terrorism takes a back seat to what the Pentagon calls full spectrum dominance. Risking war with any country without a good reason is both stupid and morally wrong. But of all the countries in the world, Russia and China are the worst ones to pick as enemies. Russia is the world’s second-largest nuclear power. It is the only country in the world with the military capability to literally destroy the United States as a nation. China is the world’s second-largest or maybe largest economic power. It has the power to ruin the United States financially by ceasing to lend money and by cutting off supplies of essential U.S. imports. The leaders of Russia and China, being rational, would not do this because they would ruin their own countries in the process. The only ways this would happen would be if they were backed into a corner where they thought they had nothing to lose or—in the case of Russia—they found themselves in a situation in which nuclear war could be touched off accidentally. The United States has by far the world’s most expensive military. We Americans spend more on our armed forces than the next 10 countries put together. But that doesn’t mean we have the world’s most effective military, especially when fighting far from home. In fact, the big U.S. military budgets may be counter-productive. Decision-makers may think the U.S. is so rich and powerful that individual instances of waste and ineffectiveness don’t matter. Or that it is not necessary to set priorities. American military strategy is based on air power. In every military action since the Korean Conflict, the United States ruled the skies. Two things could threaten this. One is an oil shortage or lack of access to oil, which doesn’t seem to be a problem for the foreseeable future. The other is a loss of the U.S. technological edge, which, according to a writer named David Archibald, is a real possibility. The U.S. Air Force latest fighter-bomber, the F-22 is a superior aircraft, but it takes 42 man-hours of maintenance for every hour in the air. F-22 pilots are restricted to 10 to 12 hours of flying per month, much less than required to maintain proficiency, because its operating cost is $58,000 per hour. The F-35 on paper is a science-fictional wonder plane. It has stealth capability. Its computerized helmet supposedly gives pilots 360-degree vision and the ability to share data instantly with commanders and other pilots. But, according to recent reports, it is like the F-22, only worse. First planned in 2001, it still is not ready. Development is more than $200 billion over budget. It lacks maneuverability. It doesn’t fly in cold weather. The computers lack software pilots say they need for combat. The ejection seats don’t work. The fuel tanks are vulnerable to lightning strikes. But the Air Force is committed to it. The main argument, according to Archibald, is the lack of a Plane B. That, and the sunk costs and the jobs and profits that will be lost of the F-35 is canceled. My friend Mike Connelly e-mailed me a link to an article on the Antimedia web site pointing out the lack of auditing or spending controls by the Pentagon, along with a helpful graphic showing just how much the Department of Defense has spent since 1996. The article was based on a three-part series in Reuters news service in 2013 about how nobody knew exactly how much money was being spent or for what, and the general lack of financial control. The Reuters articles reminded me of a similar series in the Washington Post in 2010 reporting the same situation in regard to secret intelligence and national security agencies. There, too, nobody knew the extent of what was being done, how much was being spent or whether it was effective. Claire Bernish, author of the Antimedia article, was rightly concerned about money being wasted being wasted on the military that could be better spent on other national priorities or left in the pockets of American taxpayers. I have another concern. Just how effective can the U.S. armed forces be if the Secretary of Defense can’t set priorities or know just what the department’s budget is being spent for? Is the U.S. instigating an arms race with China? There’s a school of thought that says the Reagan administration brought down the Soviet Union by conducting an arms race that the USSR couldn’t sustain. A smart writer named Mike Whitney thinks Secretary of Defense Ashton Carter plans to use the same strategy against China. China is on track to become the world’s largest economy in less than 10 years. But the thinking is that this could change if China is forced to devote significant resources to defending its position in the South China Sea. This is a perverse idea—that a peaceful China is a greater threat to American global supremacy than a militaristic China would be. It shows the wrongheadedness of world military supremacy as a goal. And there’s a question as to whether it would even work. The International Institute for Strategic Studies estimates that the USA’s military budget for 2014 was $581 billion, while China’s was $129 billion. American military spending was estimated at 3.3 percent of the total US economy (gross domestic product) while China’s was 1.2 percent. Russia’s military spending was an estimated 3.7 percent of GDP. The Chinese might well be capable of quadrupling their military spending while sustaining economic growth. They have other options. They could embargo vital electronic components that we Americans no longer produce. They could stop buying U.S. Treasury bonds, which would add to cost of financing the U.S. budget deficit. And while the burden of the Cold War may have brought the Soviet Union to the brink of collapse, it was an endurance contest that also sapped the strength of the United States. We Americans would do well to follow the example of the Chinese and build up our own nation rather than dissipating our strength in undermining others. Seven Days in May? Carter Takes Over by Mike Whitney on the Unz Review. Give President Obama credit where credit is due. He is making a good-faith effort to reduce the federal budget deficit, including reducing the Pentagon budget. Ross Douthat wrote a good article in Sunday’s New York Times about Obama’s goals. As both his critics and admirers argue, the nomination of Chuck Hagel as secretary of defense last week tells us something important about Barack Obama’s approach to foreign policy. But so does the man who was nominated alongside Hagel, to far less controversy and attention: John Brennan, now head of the White House’s counterterrorism efforts, and soon to be the director of the C.I.A. Both men were intimately involved in foreign policy debates during George W. Bush’s administration, but had very different public profiles. As a C.I.A. official, Brennan publicly defended some of Bush’s most controversial counterterrorism policies, including the “rendition” of terror suspects for interrogation in foreign countries. As a senator, Hagel was one of the few prominent Republicans to (eventually) turn against the war in Iraq. Now it’s fitting that Obama has nominated them together, because his foreign policy has basically synthesized their respective Bush-era perspectives. Like the once-hawkish Hagel, Obama has largely rejected Bush’s strategic vision of America as the agent of a sweeping transformation of the Middle East, and retreated from the military commitments that this revolutionary vision required. And with this retreat has come a willingness to make substantial cuts in the Pentagon’s budget — cuts that Hagel will be expected to oversee. To the extent that it’s possible to define an “Obama Doctrine,” then, it’s basically the Hagel-Brennan two-step. Fewer boots on the ground, but lots of drones in the air. Assassination, yes; nation-building, no. An imperial presidency with a less-imperial global footprint. I’d like to add that military spending should be sufficient to allow the armed forces to carry out their mission. The requirement is necessarily going to be much more if the mission is to dominate the globe as the world’s only military superpower than if it is to defend the homeland from attack and protect American citizens. What is President Obama’s concept of the military’s mission? As near as I can tell, he wants to wind down the war in Afghanistan as he did the one in Iraq, and he does not intend to invade any new countries, but he retains the option of using covert action and flying killer drones to attack America’s enemies, real and perceived. I’d guess that this is what the American public would want him to do. I am reminded of the Eisenhower administration, which reduced Pentagon spending, ended the Korean War and refrained from intervening in Vietnam, but used the CIA to overthrow the governments of Iran and Guatemala and threatened America’s Communist adversaries with “massive retaliation” with nuclear weapons, as a cost-saving alternative to use of ground troops. President Eisenhower in the end met with Nikita Khrushchev, and all the Presidents after him also held summit meetings until Ronald Reagan and Mikhail Gorbachev ended the Cold War. I wish, but do not expect, that President Obama would do the same with the rulers of Iran. 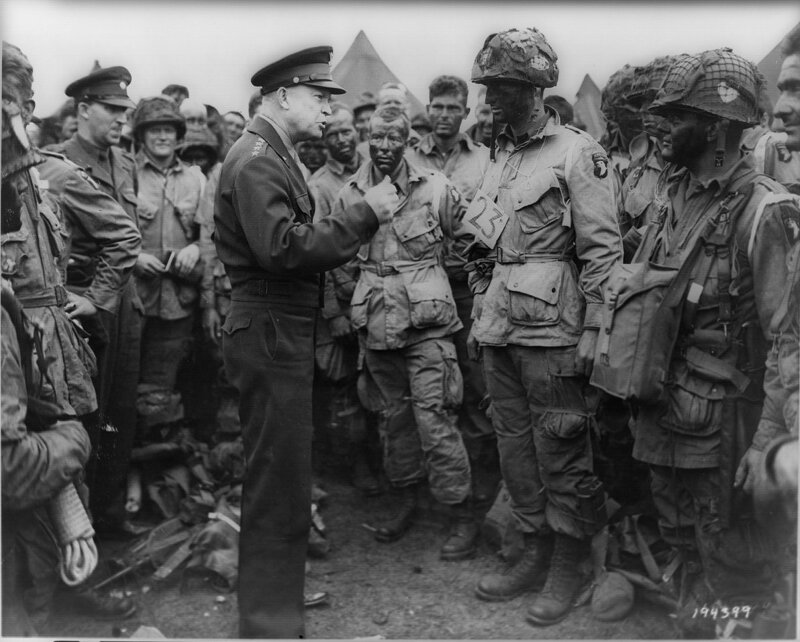 He would need much greater moral courage than President Eisenhower did, because he would not be able to count on the bipartisan support that Eisenhower received. I expect President Obama will continue to wage economic warfare, covert warfare and cyber warfare against Iran, while refraining from invading with troops or bombing from the air. 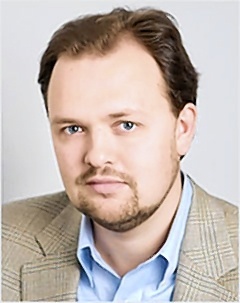 Click on The Obama Synthesis for Ross Douthat’s full article. Click on What Chuck Hagel needs to know for analysis by Brad Plumer in the Washington Post, and the source of the chart. 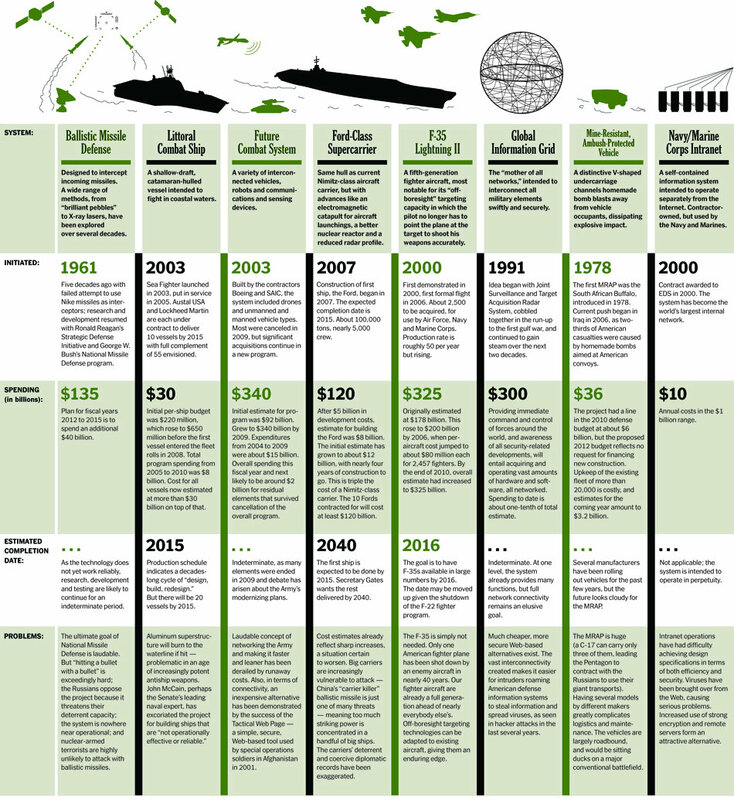 How large a military does the U.S. need? A military budget analyst named Travis Sharp did an analysis of Governor Romney’s plan to increase U.S. military spending to 4 percent of Gross Domestic Product, and concluded that, sure enough, the Romney budget was $2 trillion more than the Obama budget over 10 years. The two lines provide two alternative ways to get to 4 percent of GDP. The “Romney Ramp Up” line would increase spending by 0.1 of a percent until it reached 4 percent, and then level off. The “Romney Immediate” line would go immediately to 4 percent and stay there. Is this too much? It depends on the mission of the U.S. armed forces. If the mission is to give the United States full spectrum dominance on every continent, as well as outer space, then 4 percent may not be enough. But if the mission is to protect United States territory and American citizens, then it probably is too much. While an Obama administration would spend less on the military than a Romney administration, the mission of the U.S. military would be just as expansive and open-ended. The difference is that the Obama administration would place greater reliance on the CIA, special forces and flying killer robots and less on regular troops, and would be less likely to attack Iran with troops, but instead content itself with waging war by means of economic blockade, cyber-warfare and state-sponsored terrorism. During the past 50 years, the U.S. armed forces defeated every enemy they’ve encountered in the field. But victory in the field proved fruitless, because the U.S. forces have been been unable to compel the civilian population to obey them. The Taliban in Afghanistan, like the Vietnamese Communists, are ruthless killers and authoritarian rulers, but they are effective ruthless killers. They are embedded in the population, they know people individually, they can tell friend from foe, which a foreign invader can never do. Troop buildups and spending on military equipment will not change this. 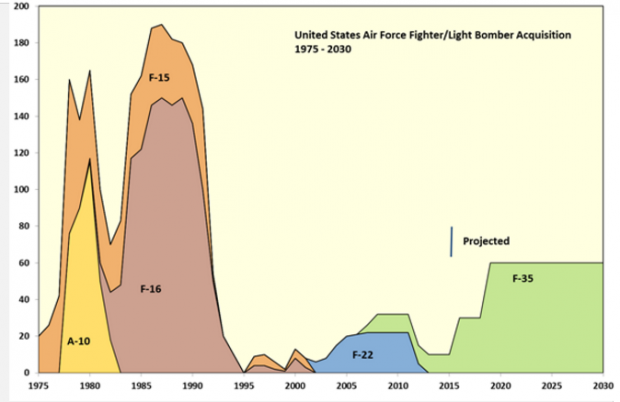 Here are two more charts, which put U.S. military spending in historic perspective. The U.S. Department of Defense budget for Fiscal Year 2011 (which ends Sept. 30) was the highest, in inflation-adjusted terms, that it has been in any year since World War Two, according to the non-partisan Center of Strategic and Budgetary Assessments. The president’s budget projects that the deficit will rise to a record level of $1.6 trillion in FY 2010. In an attempt to address the deficit, the FY 2011 budget request proposes a freeze in non-security discretionary spending, which excludes defense, homeland security, veterans, and other security-related programs. The proposed freeze applies to less than one sixth of the total federal budget and saves $15 billion, compared to a $45 billion increase in security-related spending. Click on Analysis of the FY 2011 Defense Budget for the CSBA summary for FY 2011. Click on Analysis of the FY 2011 Defense Budget PDF for CSBA details for FY 2011. The base defense budget is projected to rise another 3.6 percent for Fiscal Year 2012, from $526 billion to $553 billion, the CSBA reporter. But that’s less than the $566 billion the Obama administration originally estimated it would need for 2012. And spending for Overseas Contingency Operations, mainly the wars in Afghanistan and Iraq, are projected to decline from $159 billion to $118 billion, resulting in a decline of total spending. However, all this was written by analyst Todd Harrison for the CSBA back in February, before President Obama decided to jump into war in Libya, so the current estimate may be different. Click on FY 2012 Defense Budget Represents a Turning Point for the CSBA summary for FY 2012. Click on FY 2012 Defense Budget Represents a Turning Point PDF for CSBA details for FY 2012. NATO countries in Europe are in blue. Click map to view. 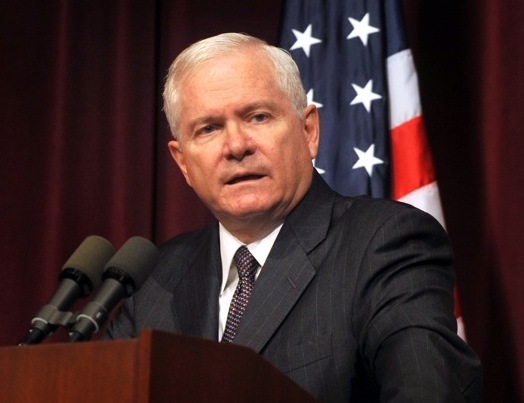 The Rochester (NY) Democrat and Chronicle this morning reported that U.S. Defense Secretary Robert Gates warned NATO allies that the United States can’t continue to support the alliance if European allies don’t do their share. Without naming names, he criticized “nations apparently willing and eager for American taxpayers to assume the growing security burden left by reductions in European defense budgets.” He said that unless something changes, NATO could cease to exist. Earlier Gates warned that if the United States cuts back on its military budget, the U.S. government will no longer be able to project its power on a global basis. Gates stated the alternatives honestly and correctly. But would the demise of NATO be such a terrible thing? Would a cutback on the reach of the U.S. military be such a bad thing? The North Atlantic Treaty Organization was created in 1949 because leaders of the nations of western Europe, devastated by war, did not believe they could defend themselves against the Red Army. For more than 40 years, the United States maintained forces in western Europe which, along with the U.S. nuclear arsenal, deterred any thought the Soviet leaders might have had of attacking Europe. Now the Soviet Union no longer exists. Western European countries have good relations with the Russian Federation. True, some of the eastern European countries formerly dominated by the Soviet Union want a U.S. guarantee. NATO has expanded to take many of them in. But is it the responsibility of United States to bear 43 percent of the world’s military expenditures to provide this reassurance? If a guarantee is needed, shouldn’t the European nations provide it? Currently NATO is mainly an adjunct to the U.S. global “war on terror.” NATO allies were quick to join the United States in 2002 in the invasion of Afghanistan, but the people of France, Britain and other European countries no longer see this as being in their interest. I think the people of the United States are slowly coming to the same conclusion – that invading foreign countries does not make this country safer. If the United States did not have military bases on every continent, and military forces able to intervene almost anywhere in the world, there would be fewer U.S. military interventions. I think this would be a good thing, not a bad thing. John Arquilla, a professor of defense analysis at the Naval Postgraduate School, in collaboration with a staff members of a design firm named Fogelson-Lubliner, wrote the following in the New York Times about how to cut the Department of Defense budget. As our government teeters on the brink of a shutdown, and Congress and the president haggle over spending cuts, the Pentagon budget should be scoured for places where significant reductions may be made. Not the handful of trims alluded to by Defense Secretary Robert Gates — $78 billion over the next five years, with these savings simply used to shore up spending on other acquisitions — but major cuts to systems that don’t work very well or that are not really going to be needed for decades to come. Unworkable or unnecessary systems tend to have something in common: their costs are often uncontrollable. A 2009 Government Accountability Office study of 96 major defense acquisition programs found that almost two-thirds of them suffered major cost overruns — 40 percent above contract prices, over all — with average delays of nearly two years. Those overruns totaled close to $300 billion, about the amount of President Bill Clinton’s last full defense budget request a decade ago. Listed below is just a sampling of what systems could be ended without endangering America; indeed, abandoning some of them might actually enhance national security. These cuts would generate only small savings initially — perhaps just several billion this fiscal year, as contracts would have to be wound down. But savings would swiftly rise to more than $50 billion annually thereafter. And there’s plenty more where these came from. –Dwight David Eisenhower, “The Chance for Peace,” speech given to the American Society of Newspaper Editors, Apr. 16, 1953. 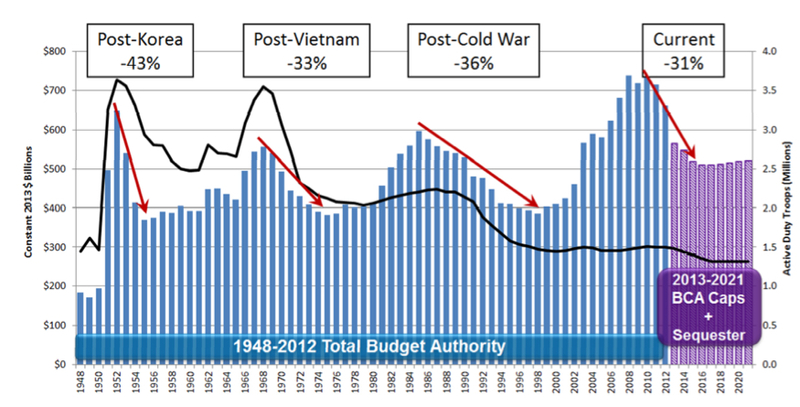 The following chart shows the ups and downs of the U.S. military spending before and after Eisenhower.